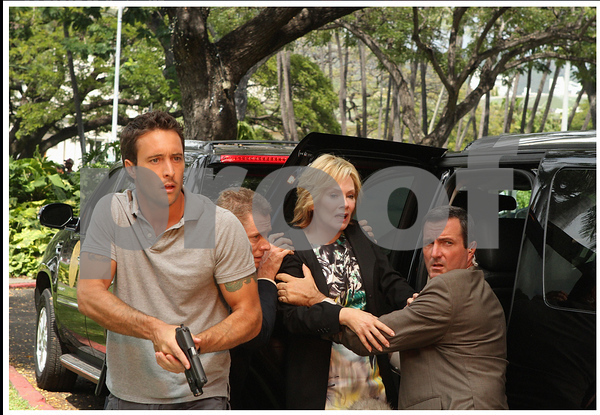 An open casting call was put out in Honolulu, Hawaii, by the production staff that produces the show Hawaii Five-0 during the summer of 2010. I thought I’d take my dog Rusty down to see if they might be interested in casting him on the show, never intending to be cast myself. We showed up at Aloha Tower Marketplace and made our way through the process of filling out the paperwork and having them take quick head shots of both of us. It took about ten minutes and as I walked out the door I never thought in a million years that they’d have any interest in me and they didn’t seem to interested in Rusty, so I just forgot about it and moved on. My phone rang on April 7, 2011 and to my surprise it was the casting director of Hawaii Five-0 asking me if I’d like to be an extra and play the part of one of the governors security team. “Sure that sounds like fun,” I said. So I headed down to base camp the next day, met with the wardrobe department and was on my way. For actors and extras on any film shoot it requires long days and lots of waiting around until your scene or scenes are ready to be shot. This particular shoot was the last episode, #24, of season one. The crew while very tired and ready for a well deserved hiatus, ran like a well oiled machine moving quickly from setup to set up without a hitch. The production assistants, director, DP, actors, stand in’s, everybody, they all flowed in sync doing a superb job. My first day on the set was a long one. My call time to base camp was 7 p.m. and I arrived an hour early. My first scene happened to be the very last shot of the day and we didn’t start filming the scene until almost 2:30 a.m. over seven and a half hours since I’d arrived on set. I didn’t arrive back home on the West side of Oahu until 4:30 a.m. I had a few days off and then shot for two more days that were just as long as my first day but it was fun. The scenes I appear in were shot during the three final days of shooting and appear during the first five minutes of the show. I ran into Brain Keaulana during my first day on the set. 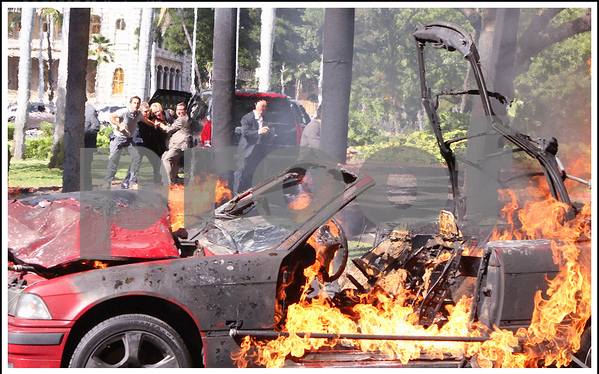 He was there as a stuntman. 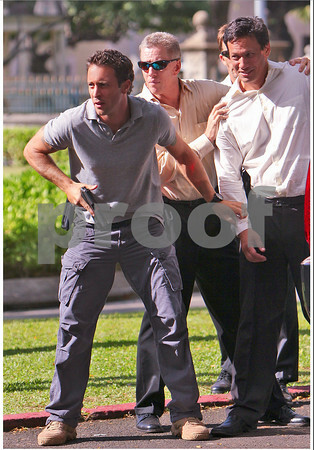 During his scene, McGarrett is attempting to break into the Governors mansion and takes Brian out as he was patrolling on foot near the front door of the Mansion. I first met Brain during the winter of 1980/81 when he was seventeen years old. I was here in Hawaii for my first time shooting photos for Surfer Magazine. I got a shot of Brain doing a nice off the lip at Makaha and Surfer published a full page color photo of the shot, my first. It was a trip reflecting back over three decades that have passed since I shot that photo of Brian and having the opportunity to work as an extra on this, one of my all time favorite shows. Brian has evolved into a legendary surfer, waterman, and lifesaver in the Eddie Aikau mold and he’s also heavily involved in the film making industry. Life certainly has a way of throwing some nice curve balls at you once in awhile out of the blue. Here I was over three decades since I first met Brain on the set of Hawaii Five-0, talking story about the shot I’d taken of him while getting ready to work on the show.